By admin | November 27, 2012. Louisa McGrath uncovers the fascinating history of Dublin’s oldest public library. Located in the heart of the Liberties, on picturesque St Patrick’s Close, is Ireland’s very first public library: Marsh’s Library. Founded in 1701 by the Archbishop of Dublin, Narcissus Marsh, the library is home to 30,000 rare books and pamphlets from the 16th, 17th and 18th centuries. The books cover a wide variety of subjects: from medicine, law and science, to literature, religion and witchcraft. There is also a room of books relating to Irish History from the last 100 years. Marsh’s library is one of very few 18th century buildings still being used for its original purpose, and the interior remains completely unchanged since it was built 300 years ago. It was designed by Sir William Robinson, who was also the architect for the Royal Hospital, Kilmainham. Every year the library holds a themed exhibition; the current exhibition is called ‘Marvels of Science: Books that changed the world’; it includes many rare, original books from scientists such as Isaac Newton, Galileo and Robert Boyle. Next year’s exhibition will be on book bindings, according to the library’s keeper, Dr Jason McElligott. “We have beautiful book bindings in our collection. In the 18th century, Dublin did the best book binding in the world; Dublin led the world it. There were many craftsmen from this area of Dublin.” This exhibition will be part of The Gathering Ireland 2013. The number of visitors to the library has risen by 20% this year, commented Dr McElligott. 12,000 tourists visited this year, which makes up for 95% of all visitors. “You might think our visitors would be older, but they are mostly 25-40 years old, and most of them are from continental Europe,” he said. People come from all over the world to do research in Marsh’s Library. The library ran a short story competition for primary school children in October; schools in the Liberties participated, including St Patrick’s Cathedral Choir School, St Brigid’s National School and St Enda’s Primary School. The library held a prize-giving for the winners last month. “We also have book binding and book craft workshops for primary school students. The book binding goes down best with the children; they end up with a nice book with leather binding at the end of the workshop.” These workshops are run regularly during school holidays. There are also science workshops planned for next year. A competition for secondary schools called ‘Curious Experiments’ is also being organised. Based on a poster in the library, which advertised a series of mysterious experiments around Dublin in 1743, the library will award €500 to the school with the best recreation of the experiment posted on YouTube. 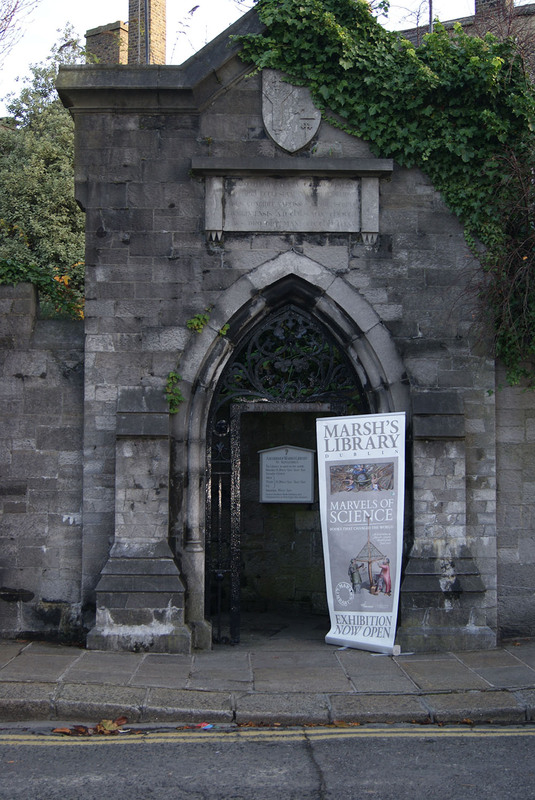 Marsh’s Library will also be holding events to coincide with Dublin festivals, including the St Patrick’s Festival, the Jonathan Swift Festival next summer and the Bram Stoker Festival next autumn (both Jonathan Swift and Bram Stoker read in Marsh’s Library). The library is open to the public, but visitors are asked to pay €2.50 or €1.50 for students and senior citizens; there is no charge for children. Guided tours and talks from experts are also available.